On Tuesday 10 October, World Mental Health Day 2017, the NHS, YMCA and young people from around the world will come together to challenge the stigma that is stopping individuals affected by mental health difficulties speaking out and seeking help. Johan Vilhelm Eltvik, World YMCA Secretary General, encouraged young people to get involved with the #IAMWHOLE campaign. Poor mental health is costing more and more children and young people their education, their employment prospects and, without action, it is costing them their lives. On the day, Tuesday 10 October, post an #IAMWHOLE selfie (see below). Take part in our creative arts competition. Paint a self-portrait, write a poem, record a song or produce something creative that expresses an emotion, i.e. smiling, laughing, crying, sadness, etc. The competition will launch on Tuesday 10 October and submissions should be received no later than Friday 20 October by either emailing iamwhole@ymca.org.uk or posting to: IAMWHOLE competition, YMCA England & Wales, 10-11 Charterhouse Square, London, EC1M 6EH. Submissions will be featured online and the winner will receive £100 (€100) vouchers. Full T&Cs can be found at www.ymca.org.uk/competitions. Picking a thick coloured pen that you feel reflects your current feelings or state of mind. 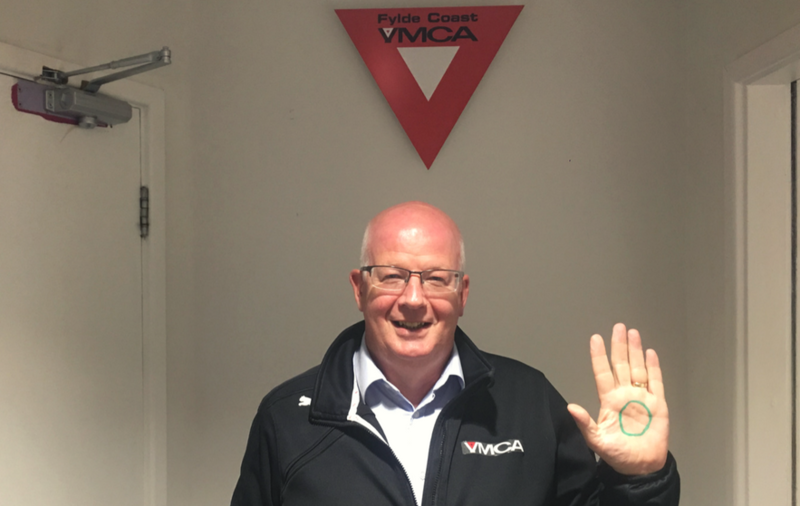 Draw the #IAMWHOLE circle on your left hand and hold it up to the camera, just like Ed Sheeran, and our CEO John Cronin.